Rotor pump is also named rotary lobe pump, three lobe pump, sole pump, etc. 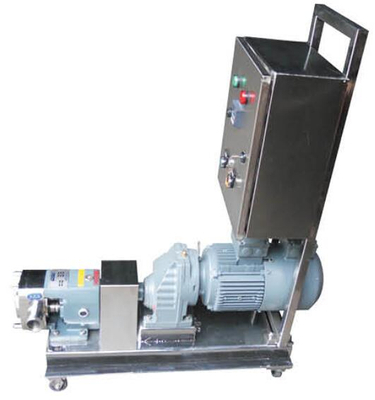 This is called Frequency Type Rotor Pump. When the 2simultaneous reverse rotating rotors (with 2-4gears) revolve, it produces suction force at the inlet (vacuum), which intakes the material delivered. Gasket: Sic, EPDM, PTFE, Viton, etc., depending on handling materials. Limited space within the pump for liquids to pool results in easy cleaning. With vertical installation a CIP process eliminates the last drop of liquid remaining inside the pump. Fixed shaft rotor: disassembly/assembly is now a simple process. Because the shaft is fixed to the rotor, the rotor can be easily and accurately installed. Flat head rotor and cover: the heads of the rotor and the cover are flat. This dramatically minimises the spaces in which liquid pooling may occur. Super clean mechanical seal: the mechanical seal is simple and compact in design. There are no o-ring grooves, which may trap liquids and this contributes to easy cleaning. Loosening the nut at the rear of the rotor unitized with the shaft enables easy disassembly, making it convenient for maintenance such as replacing mechanical seals.